They’re Back! They’re Back! Students, That is. Squeeeee! They’re back. The students are back. Walking through the rain (without umbrellas) in their winter uniforms: exercise pants and a ginormous sorority/fraternity sweatshirt for the girls, jeans and a hooded sweatshirt of any ilk for the boys. (As I don my grown-up clothes for the first time in weeks, I’m jealous of their comfort). This morning I’ve already gotten one excuse for missing class today, one request for directions to a classroom (not mine), heard of one student who registered for a course this semester that he’s already taken, and seen at least a dozen Starbucks cups. And that was just driving in and putting my stuff down in my office. Of course, I also had a nightmare about the first day of class last night. Remember in college how you’d have that anxiety dream that you’d signed up for a class but forgot to attend until well over halfway through the semester? (Oh, maybe that was just me). For me, it was always a history class. I’m terrible at (and decidedly disinterested in) history. Unless it’s fictional history and involves murder and mayhem like my favorite book of all time, Devil in the White City. But I digress. 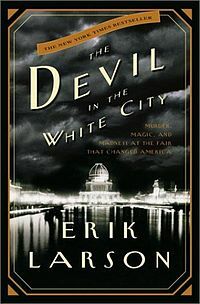 Erik Larson’s awesome book about the Chicago’s World Fair as a mask for a murdering psycho. Anyway, as a professor, that nightmare is usually that I was supposed to be teaching a class and forgot until mid-semester. (I’ve come a long way, huh?). But last night I had a nightmare about the first day of my meeting planning class. The scary part is, it was probably a pretty accurate portrayal of what’s likely to happen. So apparently I’m just scared of the way I’ve changed the course this semester. They’re planning a real conference. For a real non-profit group on campus. And that terrifies me. But that’s a post for another day. It’s SO boring around here without them. Students, I mean, not murdering psychos. I’m glad they’re back. All is right with the world again (nightmares notwithstanding). Carpe the first day of school!